The Congress on Saturday reached out to the Forum Against Citizenship Act Amendment Bill, led by noted intellectual Dr Hiren Gohain. The Congress has also decided to send a joint delegation of Assam Pradesh Congress Committee (APCC) and Congress Legislature Party (CLP) leaders on Wednesday to meet AICC president Rahul Gandhi to discuss the Citizenship (Amendment) Bill, 2016. 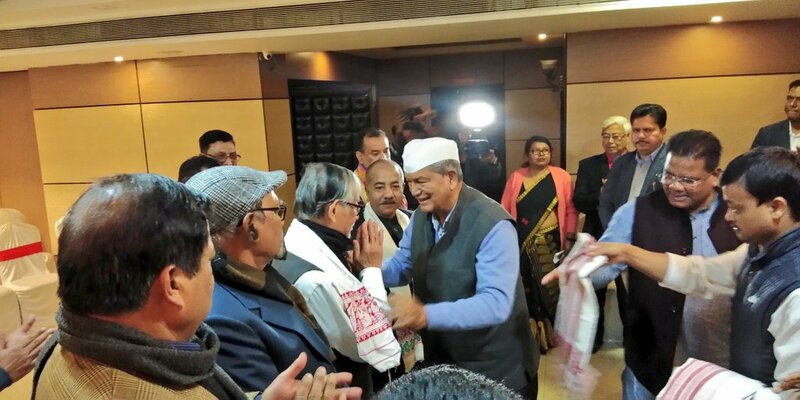 AICC general secretary in-charge of Assam Harish Rawat, APCC president Ripun Bora and CLP leader Debabrata Saikia were present at Saturday’s meeting with the Hiren Gohain-led Forum, say media reports. Apart from Dr Hiren Gohain, the meeting was also attended by other members of the Forum like Haidar Hussain, Santanu Borthakur, convenor Manjit Mahanta and Amar Asom editor Prasanta Rajguru. Earlier on Friday, the Congress had a two-hour long meeting with the Krishak Mukti Sangram Samiti (KMSS) and 69 other organizations where it apprised of its stand against the Citizenship (Amendment) Bill, 2016. During the meeting on Friday, the Congress also reportedly revealed before the leaders of 70 organisations how it planned to tackle the issue when it comes up in the Rajya Sabha during the budget session. The budget session of the Parliament will start from January 31, 2019. The Citizenship (Amendment) Bill, 2016 was passed in Lok Sabha on January 8, 2019. The BJP-led NDA government at the Centre will try to get the Bill passed in the Rajya Sabha where it has no majority. The move of the BJP in Rajya Sabha can be derailed by the Congress and other non-NDA parties. The Krishak Mukti Sangram Samiti (KMSS) on Friday sought to meet the Congress leaders and wanted the party’s support in opposing the Bill in the Rajya Sabha. They also wanted a meeting with Congress president Rahul Gandhi.